We recommend that you check the engine oil level every time you refuel. Park the vehicle on level ground. Wait approximately three minutes after turning the engine off before you check the oil. 1. 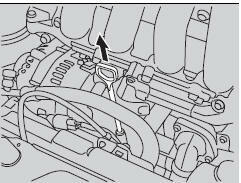 Remove the dipstick (orange loop). 2. Wipe the dipstick with a clean cloth or paper towel. 3. Insert the dipstick back all the way into its hole. 4. Remove the dipstick again, and check the level. 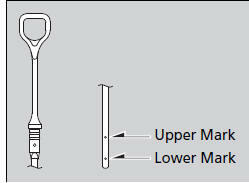 It should be between the upper and lower marks. Add oil if necessary. If the oil level is near or below the lower mark, slowly add oil being careful not to overfill.